I am also trying to use a Pci-e 8x video card with the Dell. With that, I ordered the Asus GT 630 . From what I read here it's possible to get it work. I'd appreciate any feedback. And any other video cards recommended? I do not want to mod an X16 or the slot in the system. I am ok with using an 8x for now. After many arduous hours of searching forums and trying every trick or combination of things, this is what did not work for me. * Nvidia NVS 290, PCIe-x1, boots perfect, Windows 7 sees it, but no video using the NVS 290. * Removed the DRAC card as suggested, and restarted the server. I had a 6 minute boot time, got the extended monitor to work once, then epic fail on each restart. I concluded the NVS 290 definitely does not work. * Tried an Nvidia NVS 280, PCIe-x16 as suggested in another post I read. I nodded the cars by removing pins 50-52. Installed the cars in PCIe-1. Started the computer, Windows loaded fine, but again no video on the NVS 280. I again removed the DRAC, but this time long boot hang with no video ever. Conclusion, the NVS 280 does not work. What finally did work for me! * I accidentally stumbled across an Nvidia NVS 285, PCIe-x16, HP model P283. Instead of modifying this card, I used a x8 to x16 ribbon cable, and installed the card in the PCIe-1 slot after removing the DRAC card. * I booted the computer perfect. No hangs, no bangs, even scanning the raid drives and everything, I had a total boot time of under two minutes. I don't know of this will work on any other system, model, or configuration, but this exact card, a P283 using a ribbon cable in slot 1 worked for me. I now have dual screens, an extended desktop, and a very happy client. PCIe-Slot-1: Nvidia NVS 285, 128MB, P283, PCIe-x16 mounted upside down using a x8 to x16 adapter. Removed DRAC card completely. No other changes or mods to the system. I hope this helps someone. I built this for a client I had that needed a new radio station server and it ended up turning out awesome, once I found the right card to use. I'm very interested in this discussion as I'd love to outfit a Poweredge 2950 with a graphics card for Hyper-V RemoteFX acceleration. What I'm wondering is if the slots for the riser cards on the motherboard are actual PCI-E x16 slots and if a PCI-E x16 ribbon could be used to directly connect a graphics card, in place of the riser. I'm figuring this could be especially effective if I could find a way to adapt the power supply to provide auxiliary power to the graphics card. 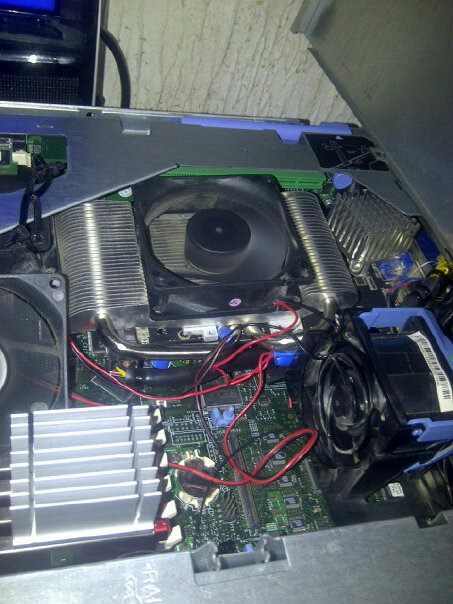 If you have a Dell Power Edge 2950 III Server and need a graphics card, this will work. NO MODS, just buy and install. ASUS GT720-2GD3-CSM GT720 "2GB" DDR3 64Bit PCI-E X8 DVI-D/HDMI Video Card. it's about $60 for the card. This is how you need to install it. 2nd connect VGA cable to server VGA connector not new video card, let it boot, install driver, re boot. 3rd now connect to new VGA, DVI or HDMI cable. 4th both cards will show , right click, screen resolutions config to one monitor or dual its up to you. Has anyone tried a evga Gtx 750 1gb card? I'm trying everything to get this to run as it doesn't require additional power and is (relatively) low wattage. I can't even get my 2950 to recognize is in the x8 slot. Therefore can't install driver. If I disable the embedded graphics maybe I can get the server to see it?? Not sure tho. Any help would be much appreciated!